Princess Tolentino spent the first five years of her life living in a shack under the flyover near the Buendia station of the Philippine National Railways (PNR). It was a harsh reality she faced with her three brothers and sister, but Princess consoled herself with the hope that their lives would one day get better. At least, magkasama kami, she thought to herself. In 2005, Princess’ world shattered, when her father left her mother for another woman. Without a steady source of income, her mother was forced to relocate them under the bridge. At the age of 5, Princess was living among drug addicts, common thieves, and Rugby boys–a gang of street children named after the ubiquitous contact cement they sniffed to alleviate their hunger. Under a makeshift roof of cardboard and plastic, Princess, along with her family, endured harsh weather and unsanitary living conditions. The constant fear of being driven away by the police haunted them. To survive, Princess learned how to beg for alms from passersby. She would pick scraps from the trash bins of fast food chains. Risking her life every day and being at the mercy of other people quickly became her norm. Her response to her hardships at a tender age was out of self-preservation and the need to have some semblance of control over her life: rebellion. At 10 years old, Princess learned how to drink and smoke. By age 13, she had entered relationships with several boyfriends. After several years, her mother finally secured a steadier job, and their lives, slowly but surely, began to improve. They uprooted themselves from the streets and moved into a small rented room. The family had a place they could call home. And, at the age of 11, Princess enrolled in first grade. Motivated by revenge and the desire to win her mother’s affection, she became obsessed with acing her subjects just to show her family what she’s made of. On her graduation day, she reached her goal: she was the school valedictorian. That day, however, she had a big fight with her mother over a petty thing. What should have been a happy occasion became one of the lowest points of her life. “Ang sama ng loob ko ‘non dahil ginawa ko naman lahat pero parang wala pa rin,” she sighs. Princess texted her student teacher to confide in her, and she invited her to come to church. “Sumama naman ako kasi aircon,” Princess laughs. They went to Victory Fort, and there, for the first time in her life, Princess heard the gospel. “Habang nakikinig ako ng preaching,” she reveals, “pina-realize sa akin ni God na kailangan ko si Jesus kasi sobrang dumi ko dahil sa mga kasalanan ko.” Princess felt a heavy burden lifted from her as she cried out to God. That same night, Princess surrendered her life, her self-reliance, her pain, and her pride, to Jesus. Over time, Princess saw how God began to heal her heart and mend her broken relationships. All the hatred inside her began to disappear. In an incredible turn of events, Princess was able to reach out to her father, who had abandoned her more than 15 years ago, and met up with him so she could tell him that she would be all right. “Hindi ko na sila sinisisi kung bakit ganon yung buhay ko,” she shares. Aside from personal healing, God also mended her life by allowing her to become a scholar of the Real LIFE Foundation. Her 7th grade teacher, Jaime Gabrera, saw her in Victory Fort and decided to connect her to the foundation. There, aside from a good education, she received mentoring, financial assistance and character development. She was molded to be a Christ-centered student, a scholar of God. While at Victory Fort, Princess was also connected to a Victory group, where she saw that Christians needed each other to grow in their faith. Encouraged by her new spiritual family, her self-esteem grew, and she learned how to be a disciple maker herself. “Siyempre hindi pwede mawala yung discipleship, kung saan tinutulungan nila ako sa walk ko with Jesus. They empower me to lead.” Today, Princess is leading her fellow students to Jesus through her own Victory Group. She is also reaching out to her family, and firmly believes in God’s promise of salvation for her entire household. Two of her siblings are scheduled to undergo ONE 2 ONE soon. 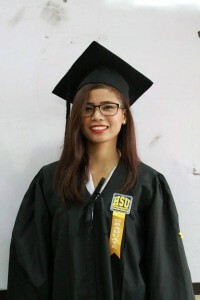 Last month, Princess graduated from high school at the University of Makati. She is the first one to ever pursue college in her family. She has high hopes, and is expectant of her life in the university where she plans to take up a degree in Finance. Asked where she sees herself five years from now, she replies with a smile, “I’ll be working hard for my family. I know I’ll be happy with the path that God will give me, like making disciples in the corporate world,” she adds. Before, Princess was a child begging along the streets of Buendia. Today, she is an accomplished high school graduate on her way to university towards a brighter future. She may have already been through much, but with her new life in Christ, she knows that this is only the beginning. Do you have a story of restoration? Share your story with us and testify of God’s goodness! I was blessed by Princess’ story. May God continue to use you in the university and of course, the corporate world! God bless you more and more Princess! A God of Miracles Join our #TheTENSeries Instagram activity!